The torch is amazingly bright for its size and I’m very happy with it. 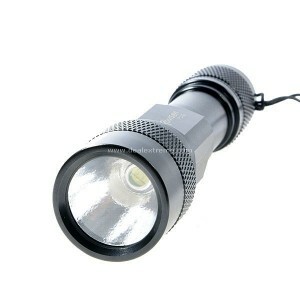 I’ve always liked torches but balked at paying large amounts of money for a quality brand like Maglite. So I tended to buy cheap, plastic torches that would last for a few months. In recent years I also bought torches containing LEDs instead of a bulb. These LED torches were relatively efficient producers of light, so batteries lasted well, but each LED was weak so the torch needed lots of them. Assembling lots of bits into a torch-head increases the cost so cheap LED torches were very crappily put together. But about a year ago there was a revolution in torch design. A US company called Cree Inc. produced a very efficient and bright emitter. Cree make their own torches but they also sell their emitters to other manufacturers (mostly Chinese) who have produced a large range of small, powerful torches. – has good build quality. This little torch is so bright it could be used for possum spot-lighting. We have a large water tower about 100 metres from our backyard. I can illuminate the top of the tank with it. So it is great for shining around outside. On the other hand it isn’t perfect for hunting for lost socks early in the morning – it’s blinding at close range. At the moment I am using a standard AA 1.2V rechargeable battery in it which seems to last for about 60 minutes. Some Cree LEDs stop working if the battery voltage drops below a certain level. This is fine for situations where a strong output is critical but not so good for a household torch where a slow reduction in output over time is much better. This torch is like that. Even when the battery is approaching the end of its charge the torch is still quite usable around the house. I took this torch with us on our 2012 ten-week trip to Europe. For a few days we stayed in a friend’s alpine hut in Vorarlberg. He liked this torch so much I left if behind in the hut as a gift. This entry was posted in Gadgets and tagged Torches on January 9, 2011 by Steven.